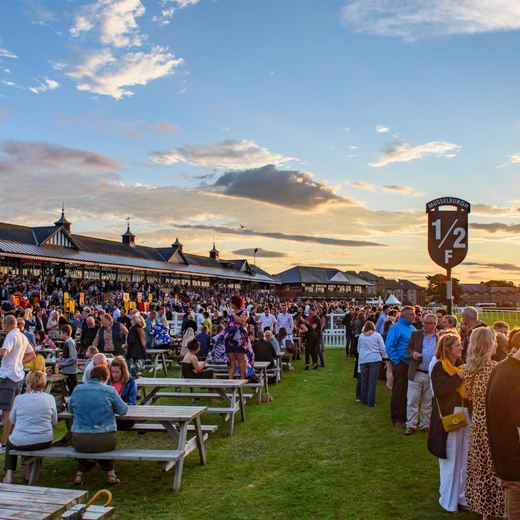 Join us straight from the office & make the most of your summer evening at the races. There is six exciting flat races to be enjoyed alongside some tasty food and drinks. Purchase your advance ticket by 11:59pm on 26th of August to SAVE £5 per Adult (On the day price £22) Children 17 & Under go FREE when accompanied by an Adult. Please note concession tickets are available to purchase at the turnstiles. Courtesy shuttle buses go from Wallyford and Newcraighall train stations. Buy more than 12 tickets, get £1.00 off per ticket. Buy more than 25 tickets, get £1.50 off per ticket. Our Early Bird ticket is a general admission ticket that provides access to all public areas and a variety of options for place to eat, drink and bet. It is at a discounted price from the gate admission and can be made up to midnight the day prior to racing. Admission tickets must be purchased in addition. A reserved picnic table to seat a maximum of 6 people. Arrive through entrance 3 to redeem. Please show your ticket to redeem. ​Add a gourmet pie and pint to your raceday! Enjoy a delicious gourmet pie from our Artisan Pie supplier “Pie Not” accompanied with a portion of chips and a pint from the bar – including Real Ale, admission and a race programme and you are all set for the day (or night)! Add a gourmet pie and pint to your raceday! 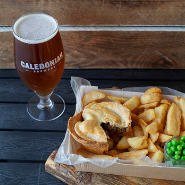 Enjoy a delicious gourmet pie from our Artisan Pie supplier “Pie Not” accompanied with a portion of chips and a pint from the bar – including Real Ale, admission and a race programme and you are all set for the day (or night)! This package is available to individuals and groups. Vouchers for food and drink will be available for collection on arrival. Your artisan pie can be collected from Pinkies Bar where you can either sit in or take outside to our many picnic tables. Please note that this package is not available on selected days including Stobo Castle Ladies Day. Add some salt & sauce to your raceday! 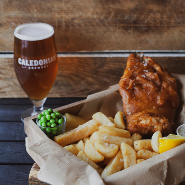 In addition to general admission, receive a Race Programme and enjoy a portion of freshly cooked fish and chips, with a choice of breaded or battered fish, accompanied by a bottle of cold beer, glass of house wine or soft drink. This package is available for individuals and groups. Vouchers for food and drink will be available for collection on arrival at Entrance 3 and group organisers should distribute to their guests. After collecting your traditional Fish & Chips package you will be able to enjoy it in our many outdoor picnic areas. Experience the races in style! Sip champagne, compare race notes and simply soak up the atmosphere of the day. 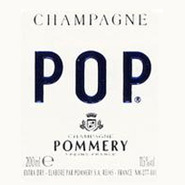 In addition to general admission, receive a Race Programme, accompanied by a Pommery Pop Champagne (200ml bottle) which can be collected from any bar. This package is available to individuals and groups on standard racedays only. Vouchers to redeem your champagne will be available on arrival at Entrance 3 and group organisers should distribute to their guests. 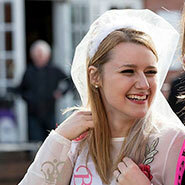 Looking for ideas with a difference for your Hen or Stag party? We have the answer - head to Musselburgh Racecourse for the perfect way to send off the bride or groom! With a great party atmosphere and thrilling sporting action you'll all be in for a brilliant day out. A drinks voucher - a bottle of cold beer, glass of house wine or soft drink. If you purchase 12 or more packages you'll get two free tickets – one for the bride and groom and one for the group organiser. Drink vouchers will be available for collection on arrival at Entrance 3 and group organisers should distribute to their guests. This package must be booked in advance and cannot be purchased on the day. Buy more than 12 tickets, get 2 free. Buy more than 12 tickets, get 2 free. Introducing the Musselburgh Champagne Experience! Perfect for a celebration with friends or family. 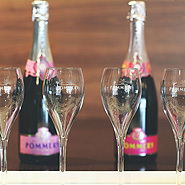 Experience the races in style at your private, reserved table on the Pommery Lawn and enjoy a tasting of the four seasonal Pommery Champagnes and receive a glass of your favourite while you soak up the atmosphere. This package is available for groups of four or multiples of four and includes general admission, champagne as stated and race programme. Places are strictly limited so we recommend early booking. On arrival, VIP admission badges should be collected from Entrance 2. ​This package must be booked in advance and cannot be purchased on the day. This is a fantastic way to spend a day with a loved one or friend. Upon arrival, you’ll be welcomed at the ‘Links’ gate along with the other race goers, horse owners and jockeys'. Included in this amazing race day, is lunch in our award winning restaurant, ‘The Harris Tweed Bistro’ with your table for the day, a glass of Pommery champagne each and a race programme. Choose from a variety of dishes from the menu, up to the value of £30 each. The Harris Tweed Bistro offers an indulgent menu full of delicious locally sourced meals, including beef and fish dishes, and our personal favourite the After Eigth cheesecake. Priority booking is given with this special package, guaranteeing your place in this popular restaurant. 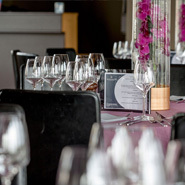 Entertain guests with a fine dining Epperston Hospitality Package. Your reserved table provides a base for the day with a three-course menu prepared and served by Heritage Portfolio. 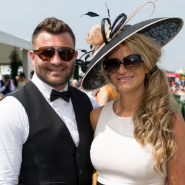 Enjoy a panoramic grandstand view of the racecourse with private bar, Tote betting and Racecourse TV. Watch the racing without leaving your seat or visit the betting ring next to the track or view the horses in our Parade Ring. The Epperston Restaurant is suitable for party sizes from 1 to 65. Advance booking is required and generally closes one week prior to the raceday. The Queen's Stand Suites offer an unrivalled position to enjoy private hospitality, with panoramic views over the entire racecourse and balconies overlooking the winning post. A champagne reception is hosted in your private suite, followed by a three-course menu prepared and served by the award-winning Heritage Portfolio. A guest 'tipster talk' and betting vouchers are also included. 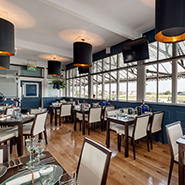 Entertain in our exclusive facilities, suitable for party sizes of 20 to 200 guests, with views of the paddock and the finishing straight and access to a private bar, Tote betting and Racecourse TV. Please see Lothian Suite details below for larger bookings. 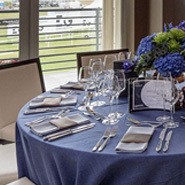 With a private trackside lawn and unrivalled views over the racetrack and parade ring, the Lothian Suite can accommodate up to 90 people, offering luxury bespoke packages. Restaurant packages are also available in the Lothian Suite on tables of 10, on selected racedays. If your booking is less than 10 guests you will be on a shared table. Please note the package is only available in groups of 10 on Stobo Castle Ladies Day. With a private trackside lawn and unrivalled views over the racetrack and parade ring, the Lothian Suite can accommodate up to 90 people, offering luxury bespoke packages. Restaurant packages are also available in the Lothian Suite on tables of 10, on selected racedays. If your booking is less than 10 guests you will be on a shared table. Please note the package is only available in groups of 10 on Stobo Castle Ladies Day. The Lothian Suite, on the ground floor of the Queen's Stand, offers hospitality packages with a fine dining menu, private garden with a panoramic view of the racecourse, private bar, Tote betting facilities and Racecourse TV.